How to concatenate cells using ARRAYFORMULA across rows and columns? I have a document that's a recurring CSV import/export. 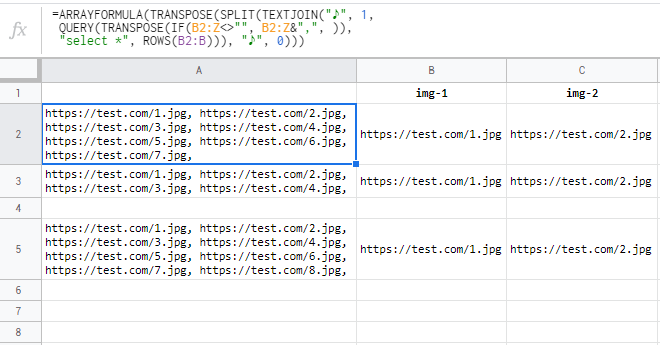 I'm trying to concatenate images separated by ", " and using ARRAYFORMULA to make it all the way down. The problem is, I don't know how many images there will be, but I know the maximum is 15. So if I concatenate, by for instance using A1+A2...+A15, I will end up with multiple commas at the end since I don't know how many there is. I have this so far =ARRAYFORMULA(JOIN(", ",FILTER(B3:P3,NOT(B3:P3="")))) in A2. Can anyone help with how I can concatenate from B2:P2 and wrap it in an ARRAYFORMULA to go all the way down? Not the answer you're looking for? Browse other questions tagged formulas google-sheets-query google-sheets-arrayformula concatenate or ask your own question. Is it possibile to concatenate with bidimensional arrayformula? How to concatenate columns for multiple rows simultaneously in Google Sheets? Use arrayformula to allow vertical formulas to expand horizontally? How to pull the page number and the number of images listed from one sheet and then populate cells in another sheet accordingly? How to scan rows for match with ArrayFormula?